For the AI counterpart, see Husk (Killing Floor 2). The player-controlled Husk is one of the playable ZEDs in Killing Floor 2's Versus Mode. The Husk is one of the few ranged ZEDs in the game. Husk has two main roles - one of them is to snipe human team from the long ranges thanks to its ability to shoot precise fireballs and the other role is an area denial - in close range Husk uses flamethrower and suicide AOE attacks. 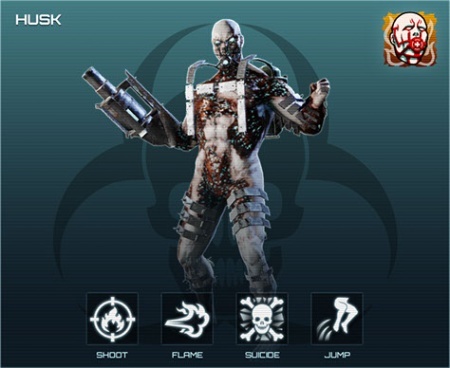 Due to Game Conductor mechanics, player-controlled Husks have their health modified based on the average level of the Survivor team. Values vary within (x0.85 - x2) range. Player-controlled Husks resistant to nearly all types of the damage except for very few cases, however they are less resistant to damage from certain tier 1 weapons. Husks are resistant to all types of the damage except for Microwave which they are neutral to. Husks resistant to every type of ballistic weaponry, without any significant cascades in the multiplier values. Husks are vulnerable against heavy (blunt) attacks of Berserker's Crovel Survival Tool. Husks are neutral against Commando's AR-15, drastically vulnerable against default 9mm Pistol and Field Medic's HMTech-101 Pistol and are slightly weak against certain shotguns. Husks have two weak spots, which are the head and the backpack. Husks will die instantly by exploding when they all out of backpack health. Secondary: Close range Flamethrower attack. Bash button: 3-hit Melee combo. Grenade button: Suicide AOE attack. Fireball. Damage - 23. Radius - 6.5m. Falloff - 1 (linear). Cooldown - 0.95s. Upon holding the charge button, Fireball strength (damage and radius) is being increased within (x0.5 - x1.3) range at rate of +0.4 per second (i.e. it will have its maximum damage / range after charging the cannon for roughly 3 seconds). Explosion radius depend from the current strength and has additional multiplier of x0.7 - actual explosion radius laying between 2.27 and 5.91 meters. Fireball leaves a ground fire (duration - 4s, burn interval - 0.25s, damage - 1, radius - 150, linear falloff). Flamethrower. Damage: Max - 10, Min - 3 (scales linearly over 9 meters). ROF - 120. Cooldown - 2s. Melee. Damage - 15. Maximum hit range - 1.8m. Vs doors - x5 more. Cooldown - 0.1s. Suicide (or Backpack explosion). Damage - 125. Radius - 6m. Falloff - 0.5 (exp). Melee - x1 (3 hits per attack). Melee (headless) - x1 (1 hit per attack). Suicide (animation duration) - 1.54s. Fireball speed - 4200 units per second. Flamethrower (animation) - 5.05s (full), can be canceled after 1.24s, flame spraying starts / ends at 0.40s / 4.50s. Player-controlled Husks start spawning at the second wave of the normal versus game.